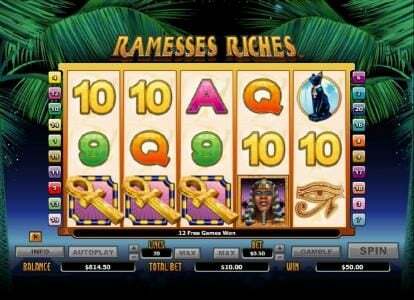 Ramesses Riches - free demo online slot machine using the Egyptian theme with 20 lines and 5 reels from NextGen developers. 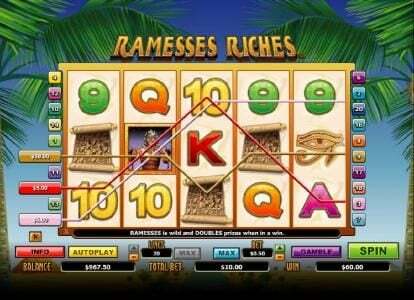 Ramesses Riches Slots has not been reviewed yet, be the first to rate this slot. 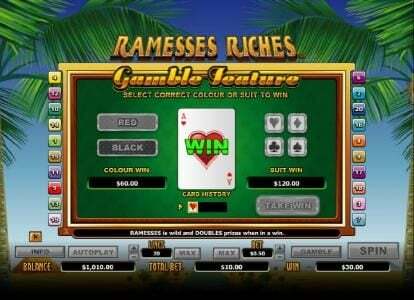 In Ramesses Riches NextGen has created a 5 reel slot with 20 paylines. 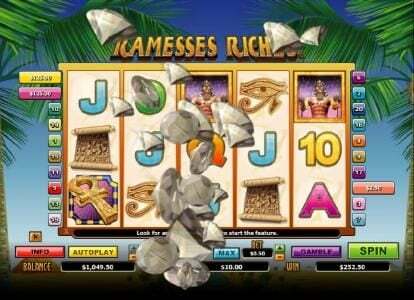 The game’s wild symbols are accompanied by scatters, free spins and multipliers, while the top jackpot gives wins up to $10,000. 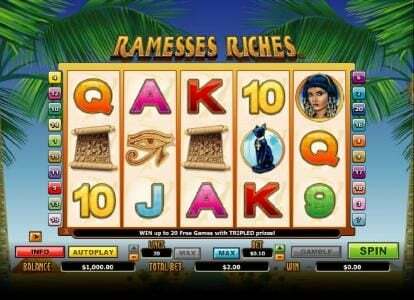 The theme in Ramesses Riches focuses on the Egyptian people and on one of their most famous pharaohs, Ramses. That character seems to be at the center of the Slot, despite the different spelling of his name that the title uses. 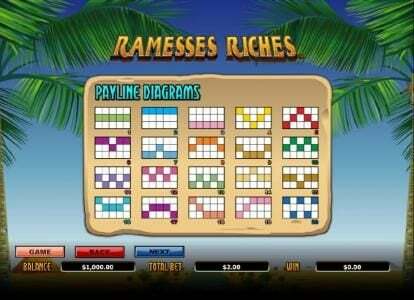 The game’s Egyptian feature is evident as soon as you look at the reels and its symbols, even though the background image only shows a small part of a pyramid with the rest of the screen occupied by palm trees. The design is pleasant and well made when it comes to the symbols, though once again the developers have used card symbols with no theme. 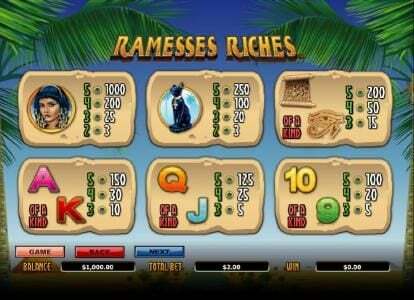 The themed icons offered by the game include Ramesses, the Ankh cross, the Egyptian girl, a black cat, a papyrus and the Eye of Ra. Looking to maximize your chances at the $10,000 prize? The first thing you should do is use the maximum number of 20 coins, which will activate all paylines in the game. The second thing would be to use the maximum coin value of $2, so that the 5000 coins of the jackpot to be worth as much as possible. The maximum wager will be $40 in this game. The wild symbol is the Ramesses character and it’s the symbol that substitutes for the others and helps the player get new combinations formed. The wild also has a 2x multiplier and he doubles all payouts that it contributes to. A combination of 2 to 5 wilds will get the player a payout, with the full combo giving him the top jackpot. The scatter symbol is the Ankh cross and it also awards payouts for 2 to 5 symbols of this type. The difference is that the scatters can be anywhere while the wilds have to be on the same line. The payouts of the scatters go up to 100 times the wager size. Whenever a minimum of three scatters appear the player gets 12 to 20 free games and 3x multipliers. If the wild contributes to a combo during the Free Spins, the total multiplier for that combo goes to 6x. Egyptian themed slots never fail to please. This one is no different and has plenty to keep you happy.